In 2012, the Trust embarked on an ambitious project to re-connect and “open-up” the whole Hogsmill River to fish passage. Since then, we have delivered 5 weir removals and 11 fish passage easements (such as rock ramps and baffle solutions). This blog is about the latest barriers tackled on the Hogsmill. The project became known as the ‘Sewage Treatment Works’ named after the adjacent Thames Water land which ultimately provided us with access to the river and barriers. Interestingly, the river is not actually in Thames Water’s ownership. This honour is split, falling to Network Rail at the upstream end and the Environment Agency downstream. This project has been an adventure, many years in the making. It has taken so long for a simple reason – the site and the complexities it poses. Due to the scale of the project, not just in regards to the physical size but also the journey it has been in developing it, I am covering the write-up in a three-part blog. 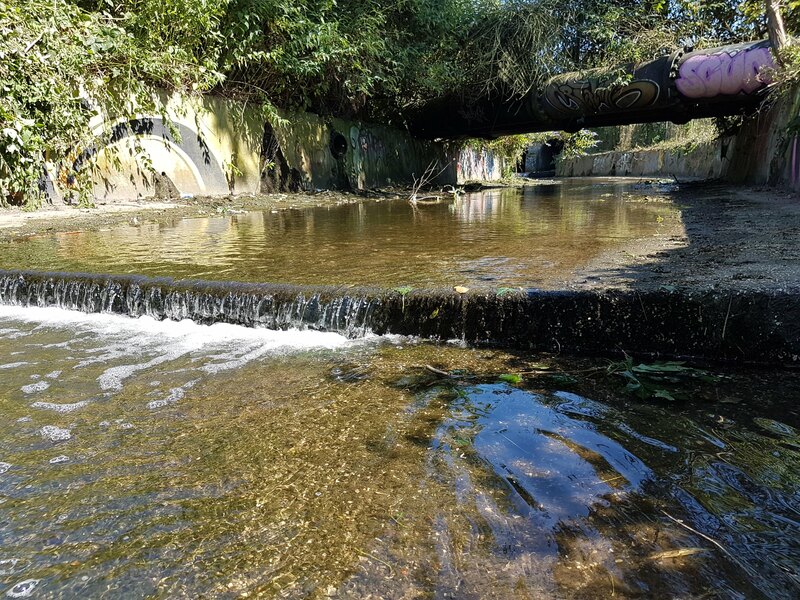 This instalment outlines the site and the issues, while the following two will focus on the solutions of how we have provided fish passage at one of the most complex sites to date. The barrier at the site were not one but multiple, all intrinsically linked. At the upstream end, the channel switches from a natural (ish) bed and banks to concrete. As we know, back in the 1950s, they didn’t just like concrete but they loved it, A LOT! Here, they created a straight 140 m length of channel with a concrete bed and concrete banks. Not wanting to scrimp on concrete, they also made this channel really wide. Consequently, the flow of water under normal conditions was incredibly shallow, forming a barrier to fish passage in its own right (Barrier 1). This was when things started to get complicated – really complicated! A little way down from the start of the concrete, the river passes under a railway through a double barrelled culvert. Seeking permission to undertake any work near the railway line is renowned for being difficult. Let’s just say, this project did not fail to live up to this reputation. Downstream of the culvert, the concrete dropped vertically to form a c.450 mm weir and this is Barrier 2. Barrier 2. The 400 mm weir at the downstream end of the railway culvert. The river then flowed for another 50 meters over yet more concrete, passing under three low 36 inch water mains before reaching another 250 mm weir – Barrier 3. From there, the water flowed over a further 20 meters of concrete before it appears they temporarily ran out of concrete. The bed returns to being ‘natural’ in the form of a five meter pool. But they then clearly sourced some more concrete to build a bridge and associated footing that at the downstream end formed another 400 mm weir (Barrier 4). All of these factors contribute to the site being impassable to all fish under all conditions. Barrier 3. The middle weir extending up to the upstream weir in the background. If those four barriers to fish passage weren’t enough, throw into the equation several surface water outfalls, buried monster sewer pipes, large water mains, massively ranging flows, a high flood risk area, multiple landownership and a string of license and legal agreements to resolve – developing and delivering this project was the most complex and challenging we have done to date. Over so many years, the project has drawn in the input from a huge range of people and organisations. These contributions have included financial, intellectual, skilled and passionate. We have conducted topographic, ecological, ground penetration radar, utility and invasive concrete surveys. We have commissioned hydraulic and flood risk modelling, and contracted structural engineers and specialist contractors. We have to thank all of those engaged in the project for enabling it to be realised. We owe a BIG thanks to those in the development phase which include (in no particular order) the Environment Agency, Horritt Consulting, Crouch Waterfall and Sitech Surveying Services. To Thames Water for providing access, and Network Rail for granting permission to alter their asset and covering their own costs. 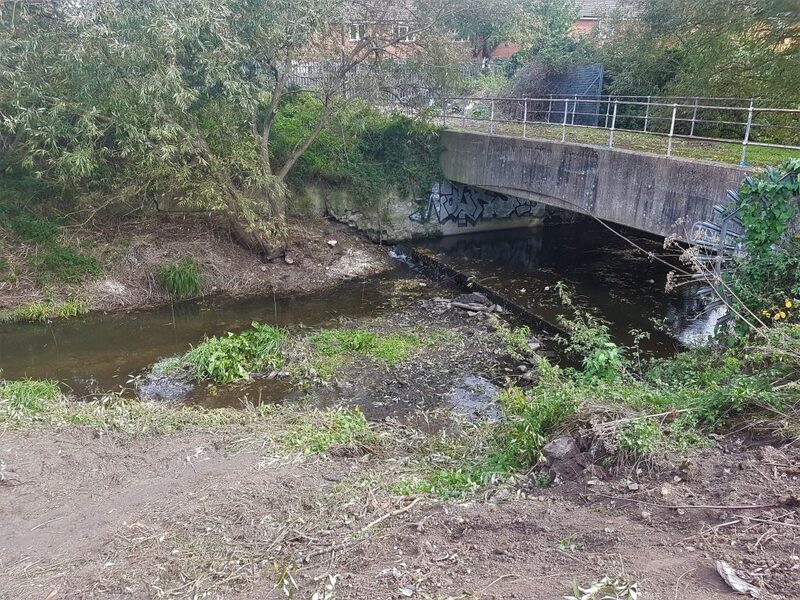 A project like this needs significant funding to be developed, and without this funding, it would have remained a complete tourniquet to fish populations on the Hogsmill. Therefore, we of course thank our funders: the Environment Agency, Thames Water and the Marine Management Organisation. ← Ofwat’s assessment of water company business plans call for price cuts – but will it ultimately be the environment that pays?